At Cakes by Robin we love nothing more than to make amazing personalised cakes. Personalising cakes mean we get to be really creative and bring snippets of people’s lives alive in cake form. It really couldn’t make us any happier. 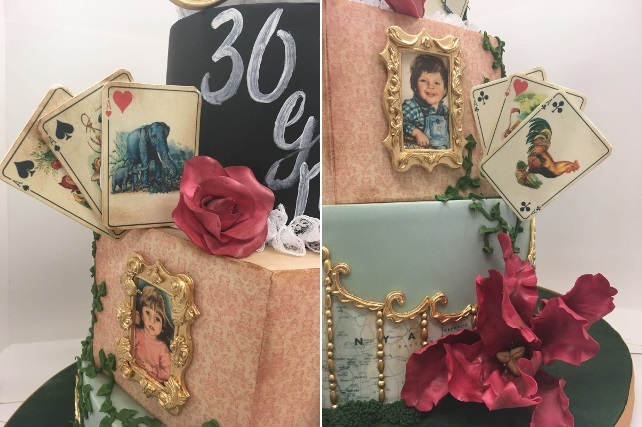 We recently made this amazing cake for a lady who was celebrating owning her own nursery for 30 years (wow, what a trooper!). 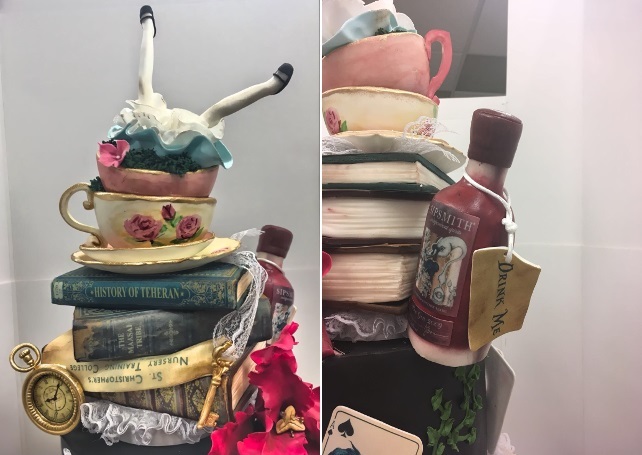 The theme was Alice in Wonderland, but we added loads of personalised bits to the cake so it was totally bespoke. 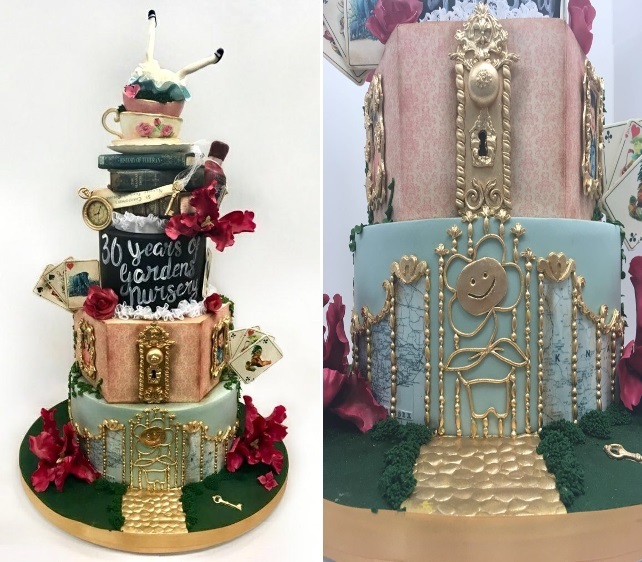 When we got the call to make the cake we were really excited to be creating a cake in the Alice in Wonderland theme – you can’t get a crazier theme than that when it comes to cakes. It’s one of our favourite themes to be honest. I mean who doesn’t love a mad tea party! We wanted the cake to be totally enchanting and totally unique. Here’s how we did it. As well as some of the fun scenes from the crazy world of Alice in Wonderland we personalised many aspects of the cake. We replicated the gate of the actual nursery in sugar, and added paintings of her three children in sugar frames. We adorned the playing cards in the Alice in Wonderland theme with her favourite animals (elephants and chickens). On the ‘Drink Me’ label we scribed her favourite tipple, Sipsmith gin. Then we added vintage maps of her favourite places around the bottom. For the crowning glory we used book titles with meaning, including a History of Tehran where she had her first nursery. We used a Chalk board style tier for the celebratory message ’30 Years of Garden Nurseries.’ What an achievement, for our customer and we have to say for us too. If you know someone amazing who deserves an amazing celebration cake, why not get a personalised cake from Cakes by Robin. We love a challenge and we’ll work with you to put a personal spin on a fabulous cake to wow. We love to make amazing cakes for amazing people.